The Diesel Doctor has a full, onsite service shop for engine repairs and services. We can get your diesel engine up and running in no time with our reliable service and experienced gas and diesel certified technicians. We take great pride in our service with a state of the art shop complete with top of the line diagnostic and repair equipment. The Diesel Doctor can start from scratch – replacing gaskets, carburetor, piston, spark plugs, and filters. We carry parts from all major engine manufacturers including Cummins, Yanmar, and Caterpillar. We also do component refurbishing and engine painting. The Diesel Doctor has a wide variety of Fuel Treatment Services. Mixing fuel additives can help remove contaminants. There are several quality products available such as Algae-X Fuel Solutions, Diesel Kleen with Cetane Boost, XDP Diesel Power Plus and more. Learn more about Fuel Treatments here. Diesel Doctor does that too! If your engine needs a quick fix or part replacement, we are quick to help with replacement alternators, filters, belts, or fuel lines. We can get manufacturer’s parts quickly delivered, or we can refurbish your engine parts onsite. Diesel Doctor uses top of the line equipment for repairs. We also offer engine cleaning from carburetors to injector cleaning. The Diesel Doctor provides turbocharger rebuilds for almost any make and model vehicle. We can repair and/or replace with premium quality parts, as well as full technical support for your turbo system. Ask us about our Turbo Charger Warranty. Have a question about turbo chargers? See FAQs here. Got a question for The Diesel Doctor? Then ask it or feel free to browse and review answers others have gotten. Just click here for the Diesel Doctor Discussion board and learn more about engines, fuel treatment and where to get parts. 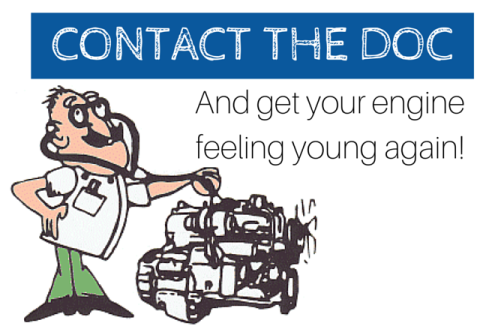 Get in touch with us so the Diesel Doctor can get to work on your engine!